Cumbia sonidera is Mexico’s bass-heavy, sound-system reinterpretation of music originally emanating from the Colombian northwest. During performances, the sonideros (DJs) mix songs and get on the mic to recite fans’ dedications to people and places. These shout-outs (called saludos) trace an auditory archive of memory, migration, and longing across the US-Mexico border. This event will feature an audiovisual conversation using cumbia tracks, field recordings, and photographs to spark discussion on a music in movement, media materiality, and the interface of the visual and the sonic. Featuring Brian Cross (B+, UCSD), Sr. Tony (Sonido Fantasma), Juan David Rubio Restrepo (UCSD), and Roman Zepeda (Turbo Sonidero). Moderated by Alexandra Lippman (UCLA). Free food provided by Zanzibar. Brian “B+” Cross is an assistant professor in the Department of Visual Arts at the University of California San Diego and co-founder of Mochilla, a production house whose output includes feature length music documentaries, music videos, music and photography. A former student of award-winning author Mike Davis and photographer Allan Sekula, Cross was the photo editor of the music magazine Wax Poetics from 2004 to 2010, and Rappages from 1993 to 1998. He has worked in hip-hop culture as a photographer and filmmaker for over twenty years. Cross’ 1993 book on the LA hip-hop scene, It’s Not About a Salary, was on “best book of the year” lists for Rolling Stone and NME magazines, and Vibe named it one of the top ten hip-hop books of all time. His latest book, Ghostnotes: Music of the Unplayed, was published in 2017 by University of Texas Press. Sr. Tony Sonido Fantasma is a prominent sonidero born in Puebla and based in Los Angeles. In his performances, he DJs cumbia while improvising saludos (shout-outs or dedications) from his fans to their absent loved-ones and family members. These saludos create an auditory archive of feelings of longing and love for families separated by the border. With 27 years of experience, Tony is renowned for his skillfulness on the microphone and for his powerful sound system. Alexandra Lippman is an anthropologist, DJ, and postdoctoral scholar at UCLA with the Institute for Society and Genetics. Her research explores the politics of sound, cultural and intellectual property, and technology in Latin America, primarily Brazil. She produced and curated ¡Un Saludo! Mexican Soundsystem Cumbia in LA, a compilation which highlights how Discos Barba Azul, a small music shop and label in downtown LA, became a hub of border-crossing cumbia sonidera in the United States. She founded the Sound Ethnography Project and is a member of the artist collective and independent music label, Dutty Artz. Juan David Rubio Restrepo is a PhD candidate in the Music Department at the University of California San Diego originally from Manizales, Colombia. He is a musician, composer, improviser, and researcher. He has presented on genealogies of popular music, decolonialism, time, and technological agency and teaches a popular course on cumbia. Roman Zepeda (Turbo Sonidero) is a music producer hailing from San José, CA who blends Rap/Hip-Hop with Cumbia Sonidera. In 2010, he moved to his father’s hometown in Puebla, Mexico to immerse in Cumbia Sonidera culture, where he played and toured extensively in the country. He is one half of Grupo Jejeje and a co-founder of Sonido Clash, a cultural arts collective exploring latinx art + sound. He has been featured in FADER, Afropop Worldwide, KQED, and XLR8R, among others. As part of the Getty initiative PST:LA/LA, LACE presents La Pista de Baile, a participatory performance by Colectivo AM. This project reflects and rethinks how community relationships are articulated in Los Angeles by connecting communities in one collective performance. La Pista de Baile, a public invitation to dance together with local DJs, shortens geographical and cultural distances between participants. In the week before the performance, Colectivo AM will document dance steps across LA using a portable photo booth to add to the Banco Universal de Pasos, with a Living Research Station displaying the findings in LACE’s storefront. The completed Banco will be presented at the final performance. La Pista de Baile will address the question of how to create community relationships that can evolve into political actions. Intended not only for mature and specialist audiences but embracing popular culture, the project will encourage a wide range of participatory and diverse publics. Colectivo AM has researched choreographic phenomena that emerge from everyday life, far from the art world, from viral videos to protests. Colectivo AM’s explorations hold the highest potential for radicalizing choreographic practice. In collaboration with the Los Angeles LGBT Center, Kaos Network, Southern California Library, Hollywood and Boyle Heights Farmer’s Market, Dublab, Bedrock, Surface Productions, and more. The Colectivo AM was born at the end of 2010, after a funeral service taking place in the Teatro de la Danza, in Mexico City, during the closing stage of the choreographic project Sala Tomada. The current members of this collective are choreography and live arts related artists, passionated about history, advocates for reflection and for self criticism. Though various nationalities gather here, all of them are mostly based and developing their work in Mexico City. Every member has their own artistic project (be it choreographic, performative, theoretical) but in AM they have found a platform for exchange and negotiation, for sharing processes, questioning methods, comparing results, proposing academic activities, and eventually, for working collectively around performance projects. Since 2010, the Colectivo has carried out the following choreographic projects: El cuerpo como centro, a choreography/politics issue for Tierra Adentro Magazine, curated by Leonor Maldonado and written by members of the collective (2016). Antes de la Playa está el Mar (Before the beach, there is the sea) (Centre for Digital Culture, Mexico City 2015), La Pista de Baile The Dance Floor and Banco Universal de Pasos Universal Steps Bank (Cuernavaca, Mexico April 2014), thought and produced specifically for Between Utopia and Disenchantment, curated by Sofía Olascoaga; a book edited and published by the MUAC (Museum of Contemporary Art of the University of Mexico), coordinated by Alejandra Labastida; a multiple project including workshops and performances around Mexico and in Spain and NY, and the making of the piece Reef: Archive, body and language (August 2013), a choreographic exhibition for the MUAC; Roadbook, a choreographic cookbook (2013) a book on choreographic processes funded by PADID (part of the National Centre for the Arts) and published with the support of EPRODANZA; 1940 La Coronela (2012), a choreographic documentary on Mexican Modern Dance performed in Reposiciones in 2012 at the Teatro El Milagro, and at CICO and the University of Sonora in 2013, a lecture performance on the history of dance with a de-colonialist turn, performed in Reposiciones 2011, Choreographic gazes at the National University, Uva Tlatelolco (Mexico 2012), CICO (2013) and the 4×4 International Festival in Xalapa (2013). Current Members Esthel Vogrig, Alma Quintana, Anabella Pareja , Nadia Lartigue Zaslavsky, Bárbara Foulkes, Leonor Maldonado, Juan Francisco Maldonado, Nuria Fragoso, Jésica Elizondo, Aníbal Conde, Magdalena Leite and Zulai Macías. Presented as part of the Pacific Standard Time Festival: Live Art LA/LA, organized by REDCAT and supported by a major grant from the Getty Foundation. Pacific Standard Time: LA/LA is an initiative of the Getty. If you’re in New York, join me for a conversation and listening with Jace Clayton (DJ /rupture) and Alejandro Aviles (Sonido Kumbala) at Union Docs, a non-profit Center for Documentary Art in Brooklyn on December 16th. Cumbia sonidera is Mexico’s bass-heavy, sound-system reinterpretation of Afro-Colombian folk music. During performances, the sonideros (DJs) mix songs and get on the mic to recite fans’ dedications to people and places. These shout-outs (called saludos) trace an auditory archive of memory, migration, and longing across the US-Mexico border. Hosted by Jace Clayton, who features a chapter on NYC cumbia and Sonido Kumbala in his book Uproot: Travels in 21st-Century Music and Digital Culture, this evening will use tracks from NYC- and LA-cumbia sonidera compilations by Sonido Kumbala and Alexandra Lippman (Xandão) to spark discussion on the roles of the sonidero, immigrant media systems, and translation. Afterwards, stick around for the Annual UNDO Holiday Party – DJ sets from Kumbala, Xandão , and DJ /rupture! For more information and tickets, go to the event page at UnionDocs. Re-posted from “Considering Money Stuff” on Socializing Finance. Money is the most commonly circulating art form. At the same time, payment objects are unstable and excessive, frequently transforming their status from money to trash to art (and back again). Argentinian artist, Máximo González—who I write about—weaves out-of-print Mexican pesos and discarded scraps of currency into fabrics like The World’s Garbage (2012) and creates collages from out-of-circulation currency into Landscapes with Landfill (2003, 2005) transforming the trash of cash into art (potentially convertible to cash). Through our repeated handling, however, the art of money stuff becomes unremarkable. U.S. dollars—through their uniform color and dimensions—appear particularly adept at fading into the background. By curating payment objects in Paid: Tales of Dongles, Checks, and Other Money Stuff, Bill Maurer and Lana Swartz take these things out of circulation. Each of the chapters sets a particular type of “money stuff” aside and asks the reader to take a moment with it. The chapters reveal the personal stories, history, memories, and beauty bundled up in diverse objects of payment. We, the readers, must pause to consider the complex ways in which we keep track, tally, make jokes, create art, and remember through objects of payment. Money stuff also inspires art. While Square may have killed the signature—how can we take our finger-painted “signatures” seriously?—it also gave birth to electronic signature art. When asked for their e-signature, artists, as Bill Maurer relays, instead draw scenes such as “the sun setting a house on fire and people running away and one guy on fire.” Not only are these “signatures” accepted by merchants, but also collected in ‘zines devoted to this new art form. More than 250 years prior, Benjamin Franklin pressed foliage—raspberry leaves, fern fronds—into the printing press to prevent the counterfeiting of bills. Printing from nature—as beautiful and seemingly whimsical as it is hard to replicate——Whitney Trettien suggests, “authenticated the strange materiality of money” (2017:163). Inspired by Maurer’s and Swartz’ remarkable work editing Paid as if curating an imaginary exhibition of money stuff, I ask what the possibilities for curation are within scholarship. To mark the publication of Paid, I have experimented as a collaborative scholar-selector by curating an unofficial soundtrack to the book. I asked chapter writers to send their favorite songs about money to mix with my own. The playlist explores some of the ways in which payment is represented and debated in different genres, time periods, and places. From Horace Andy’s dubby repetition of “Money, money, money is the root of all evil,” to Wu-Tang Clan’s “Cash Rules Everything Around Me,” money stuff inspires music. Not only that, but money—as the sampled clink of coins or whir of bills being counted—becomes music. Money—or often the idea of if—is also sonified. On YouTube, a two hour-long track of water bubbling, rain, and whirring, “Sleep Programming for Prosperity-‘Millionaire Mindset’ -Attract Abundance & Wealth While You Sleep!” boasts 2 million hits. Hundreds of other (very popular) tracks promise to attract money to the listener through subliminal binaural beats, hypnosis, or spoken affirmations in various languages. In a very different vein, artist and writer, Jace Clayton, is planning a project to sonify the data of financial markets. Gbadu And The Moirai Index, which will take place on Wall Street, by using an algorithm to translate the financial market’s movements into a musical piece for four voices. Each singer plays a mythological character — the Moirai are Greek goddesses of fate and Gbadu is a Dahomey fate deity, and the performance will reflect on the history and architecture of Lower Manhattan. Through curating writing and music on money stuff, we insist on how money does not flatten relations nor create frictionless universal equivalence. Instead, we draw attention to how we continue to mark, transform, particularize, and aestheticize money and payments at every turn. Hot off the press! Paid: Tales of Dongles, Checks, and Other Money Stuff just came out on MIT Press. I have a piece on dirty dollars as art and trash included in the volume, edited by Bill Maurer and Lana Swartz, alongside essays by David Graeber, Keith Hart, Taylor Nelms, Jane Guyer, Bruce Sterling, and others. As Lana said, “It’s the book on khipu, dogecoin, Diner’s Club, dongles, airtime, signatures, ATMs that you didn’t know you needed.” Get yours here!! With such a wealth of songs about “money stuff,” I also decided to create an unofficial mixtape for the book. I asked Paid‘s authors and editors for their favorite songs about money and payment to add to the mix. If you know any songs about khipu, e-signatures, or airtime gifts, send them my way! Movements, Or What Sound Does the Earth Make? This evening at USC Visions and Voices is hosting an interdisciplinary event on seismic waves, Autotune, and Earthquake Quartets. I heard a version of Jace Clayton‘s discussion of the surprising connection between earthquake science and the pitch correction software at The Golden State Record. If you’re in the Los Angeles area, I highly recommend attending!! The earth hums along to its own soundtrack. If only we could listen to it. When the ground beneath us shifts, as it is prone to do in Los Angeles, it unleashes enormous quantities of energy as seismic waves. Packing a destructive punch, these waves race through the earth like sound waves through air. In fact, seismic waves bear many remarkable similarities to sound waves. But though we feel them as earthquakes, we can’t hear them; their frequencies are simply too low for the human ear to detect. What if we transposed earthquake waves to an audible frequency? 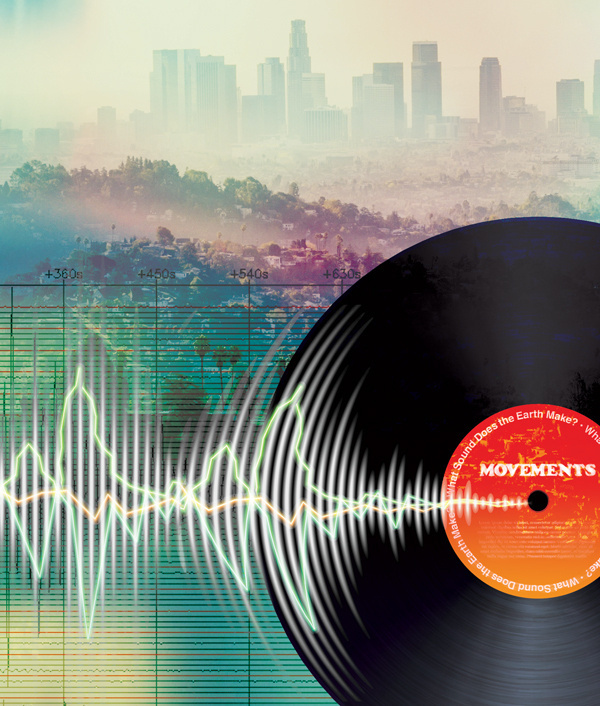 This fascinating event will bring these normally inaudible sounds to life through a panel discussion, scientific demonstrations of how seismic waves affect our built environment, experimental sonification of seismic data, and creative musical interpretations. Participants include seismologist Lucy Jones, known to many Angelenos as the longtime public face of earthquake science for the U.S. Geological Survey; composer and USGS geophysicist Andrew Michael (Earthquake Quartet #1); USC Dornsife College earthquake geologist James Dolan; USGS physicist Stephanie Ross; and sound artist DJ /rupture. The discussion will be moderated by Josh Kun of the USC Annenberg School for Communication and Journalism. I am excited for Dave Novak‘s upcoming talk May 26th at UC Davis. I will serve as the discussant for his talk, which is co-sponsored by Science and Technology Studies, Innovating Communication in Scholarship and Center for Science and Innovation Studies. If you can attend, please RSVP.